This city is the capital of the island of Madeira. 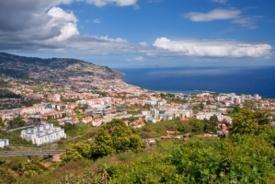 Funchal, where rows of white houses climb the hillsides, is comprised of three distinct sections. The Old Zone, or Old Town, on the east side boasts historic architecture. The west side is the "touristy" hotel area, with attractions like the Casino Gardens, Quinta das Cruzes Museum and bustling Carriera Street. Between the two you'll find the city center, which brims with museums such as the Madeira Wine Institute.